When working with customers, resource planning and scheduling can be a complex task. Appointments enable you to meet your customers where and whenever needed. OTRS supports this requirement with calendars. Calendars allow management of appointments and resources inside the ticket system. You can connect your tickets to scheduled tasks and make them available to all users to see. This feature adds transparency to show your teams workload and prevent users from promising resources which are not available. Use this screen to manage calendars in the system. A fresh OTRS installation contains no calendars by default. The calendar management screen is available in the Calendars module of the Administration group. Click on the Add Calendar button in the left sidebar. Calendars can not be deleted from the system. They can only be deactivated by setting the Validity option to invalid or invalid-temporarily. Click on a calendar in the list of calendars. Click on the export icon in the list of calendars. Choose a location in your computer to save the Export_Calendar_CalendarName.yml file. Click on the Overwrite existing entities checkbox, if you would like to overwrite the existing calendars. Click on the Import Calendar button. The calendar color that will be displayed in the calendar overview screens. To change the calendar color, just select a new color from the color palette. You can chose from the pre-selected colors or define other colors by choosing it from the color selector or typing the hexadecimal value. Select which Groups can access the calendar. Depending on the group field, the system will allow users the access to the calendar according to their permission level. Read only: users can see and export all appointments in the calendar. Move into: users can modify appointments in the calendar, but without changing the calendar selection. Create: users can create and delete appointments in the calendar. Read/write: users can manage the calendar itself. 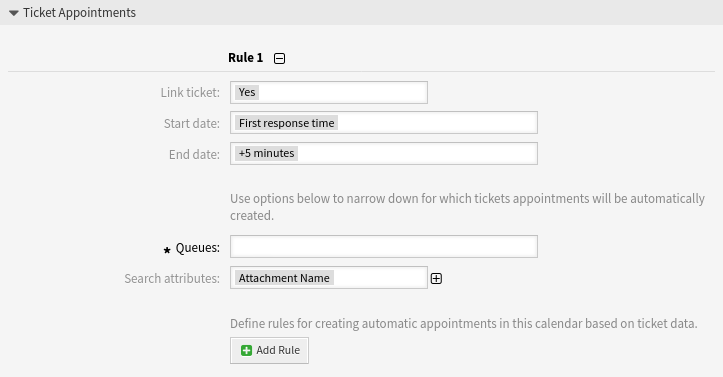 Define rules for creating automatic appointments in this calendar based on ticket data. To add a new rule, click on the Add Rule button. Select a start date for the ticket appointment. Select the end date for the ticket appointment. Select one or more queues to narrow down for which tickets appointments will be automatically created. Additional search attributes can be added for further filtering by selecting an attribute and clicking on the ⊞ button. If at least one calendar have been added to the system, it is possible to import some appointments into the calendar. Click on the Import Appointments button in the left sidebar. Upload an iCal file and select a calendar. Click on the Import appointments button. Click on the Browse… button, and select a valid iCal (.ics) file to upload. If desired calendar is not listed here, please make sure that you have at least create permissions. If checked, all existing appointments in the calendar with same UniqueID will be overwritten.